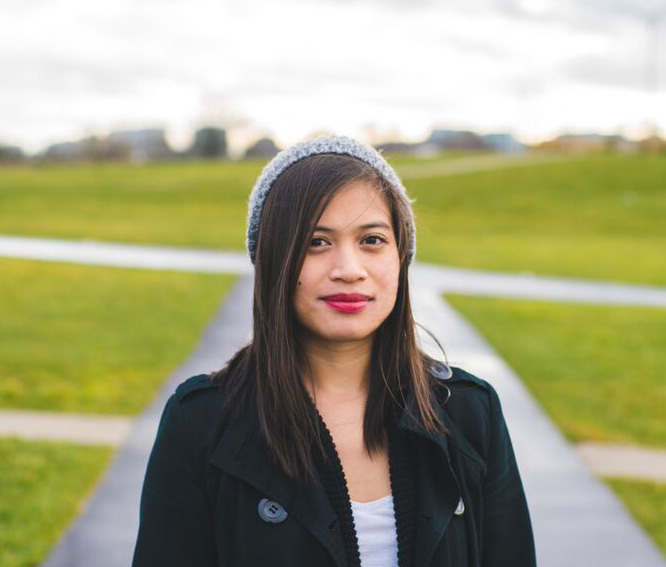 Wishpond is proud to welcome a new graphic designer to the team, Daisy Muñoz. She brings a depth of experience and a wealth of creativity. We're excited that Daisy will be bringing that experience and creativity not only to the accounts of Wishpond's valued fully-managed clients, but also to the production of new landing page templates. This article will cover the five landing page templates Daisy is proud to have released in the past week. Each of these landing page templates (as ever) have been mocked up by our user experience and conversion rate optimization team and then given to graphic designers to create within our builder itself. So I'll also be breaking down and analyzing the strengths of all of these templates, as well as providing you with links so you can start editing those exact templates for yourself, without signing up, giving your email address or credit card or anything whatsoever. To dive right into using our new "Big City" landing page template (without signup or credit card or anything), click here. The built-in countdown timer is front and center, where it can have the most affect on visitors. Countdown timers within event landing pages like this one have shown to improve conversion rates up to 300%. The unique color scheme is refreshing, modern, and appealing. The use of purple and a perfectly contrasting green is rare but super effective. Against the grey these colors work really well together. The "featured" event package (in contrasting purple at the bottom, there) is another element which has proven to improve conversion rates in Wishpond's in-house tests. The city images are high res and (on the bottom) automatically parallaxed, meaning the image scrolls as the visitor does. These touches of high professionalism make all the difference in landing page optimization. To dive right into using our new "Seattle Startup" landing page template (without signup or credit card or anything), click here. I love that the Seattle skyline is duplicated at both the top of the page and the bottom, creating visually appealing continuity. The color scheme, particularly the contrasting green CTA buttons against the textured blue at the top and the grey at the bottom, is excellent. The template takes advantage of four of Wishpond's more than 500 perfectly scalable "FontAwesome" icons to help communicate information quickly and easily. The page is super simple but still allows for users to add as much, or as little, information as they like and still retain the look. To dive right into using our new "Sunflower Startup" landing page template (without signup or credit card or anything), click here. This landing page is an excellent example of an "inspirational" template. Although it's likely you'd have to replace the images for your own brand, their full-width, the color scheme and the overall layout should be retained to keep the optimization. In point of fact, I love the color scheme here. 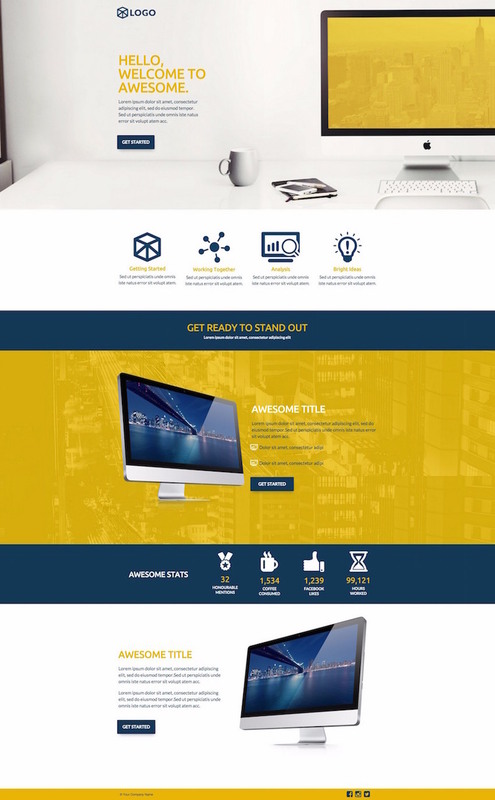 Though dark blue is one of the most frequently used "startup" colors, the pervasive yellow accent color not only contrasts well but brings an element of fun and youthfulness to what would otherwise be a very sincere page. The CTA "get started" is consistently one of our winningest copy iterations (without an exclamation point). 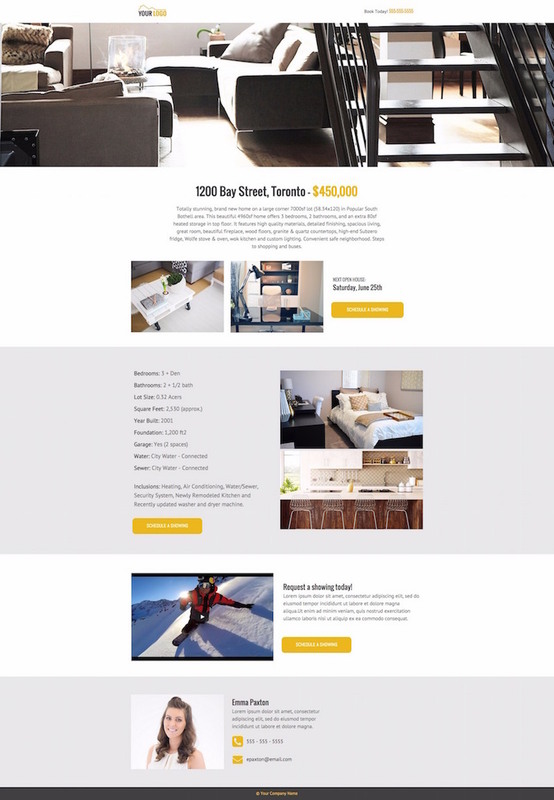 To dive right into using our new "Bay Street" landing page template (without signup or credit card or anything), click here. Landing pages are one of the most underrated marketing elements for the real estate sector. This one - professional, clean, emphasizing conversion and eliminating the nav bar - would have a tremendous effect on an agent's (or team's) lead generation. The three CTAs are identical in terms of objective, but correspond to different sale elements (the open house time, the property details, and the video walkthrough). This is best practice. The simple structure of this landing page (5 rows of alternating color) makes it extremely easy for you to replace content without breaking the proven, visually appealing layout. To find out more about where landing pages fit into the real estate sales funnel, check out my article "How to Create a Modern Real Estate Sales Funnel." 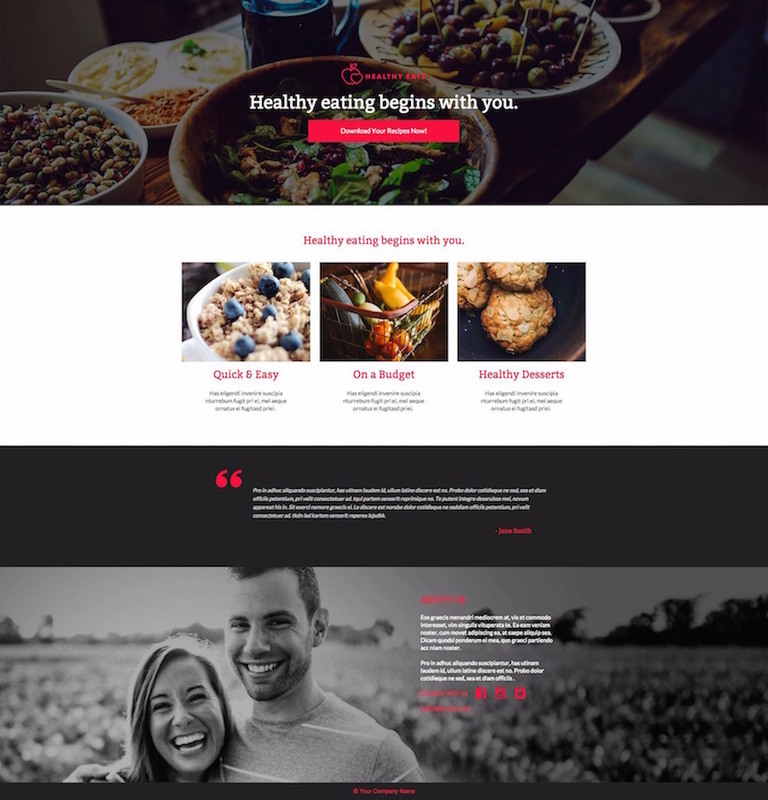 To dive right into using our new "Quinoa" landing page template (without signup or credit card or anything), click here. This is what a modern squeeze page looks like. No more white space, book image and aggressive form. It's 2016, let's get professional here. The top CTA button would open a click popup with the lead-generating form. This is a test we've seen boost conversion rates by around 50%, compared to an on-page form. The contrasting crimson on grey is extremely clear and grabs the eye effectively. Wishpond has a few accent/base color pairings and this is one of the most effective. Despite its modern look, this page retains a lot of the crucial, traditional, landing page element: large emphasis on appealing headline, between two and four "more information" sections side by side, the testimonial, the social share icons and the visual "about us" section. These five new landing page templates are just the very beginning of what's to come. Daisy and the landing page optimization team are going to be releasing up to 5 new templates every week, and I'll keep telling you about them! If you have any questions about these templates or the Wishpond landing page builder, don't hesitate to reach out in the comment section below.